NEW YORK -- This week the feud between David the chicken and Jordan the model continued on "The Bachelorette." Jordan thinks David is "dry" and eats too many scrambled eggs. David thinks that Jordan isn't there for the right reasons and that he's inappropriate (because he walked around in his undies last week). Colton, meantime, is freaking out about what Becca thinks about his dating past with Tia from last season's "Bachelor." Chris Harrison dropped off a date card and explained there would be two group dates and one one-on-one date this week. The first date card read, "Wills, Jason, Jordan, David, Jean Blanc, and Colton it's time to relax." Some ladies from last season's "Bachelor" showed up. Becca said they were her support system when Arie broke up with her. Caroline, Becca, Tia, Seinne, and Kendall were excited for a day at the spa. Tia explained that she dated Colton before their season of "The Bachelor" even aired. It's definitely going to be awkward. Colton was shocked to see Tia. The look on his face was priceless. While introducing the men to her friends, Becca forgot Jason's name! It was really funny! They all got changed and Jason pulled Colton aside and told him he needs to find time to address things with Tia. The guys pampered the girls and painted their nails and gave them massages. They seem like they'll make excellent husbands! Colton and Tia continued to avoid each other's gazes. Becca pulled Tia aside to talk about her past relationship with Colton. They were talking for a while, but he was pretty upfront to Tia about applying for the show. Apparently, he thought that there was a chance Tia could be "The Bachelorette." But, it was Becca so...is he there for Tia or Becca? That's Becca's big question. Later that evening, Becca's goal was to talk to Colton again. Talk about beating a dead horse. This storyline is kind of dragging, and does anyone even care? Ha, the guys were sitting around in the lounge with their painted nails. They all hoped to get some alone time to chat with Becca. Jean Blanc was very smooth and pulled Becca away mid-conversation with the group. He revealed that he brought a head massager with him - just in case. In case of what exactly? Becca told Jason that she has a little crush on him and that she was so sorry she flubbed his name. He told her not to worry about it and he's so happy to spend time with her. He started making out with her so that she wouldn't forget him again. Jordan said that he's got a record of matching 100% on Tinder with anyone he wants and says he has 4,000 matches for the year. He's just trying to mess with David as much as possible. He refuses to answer his questions for fear that David thinks he's being taken seriously. David decided to use his time with Becca to talk garbage about Jordan. He says, "I'm not one to throw people under the bus..." but really? How is Becca supposed to know that? She's spoken to the guy for a matter of minutes and all he does with his time is talk about Jordan. Becca goes into the room and says, "4,000 matches Jordan, high-five!" She did not seem amused. The other guys thought it was a jerk move for David to tell Becca what Jordan had said. Jordan apologized to Becca and said that he's a "golden retriever" in a relationship. He said, "You are something that I would like to see myself next to, you are the goal." David and Jordan started fighting again after this and Jordan said, "I'm a Wilhelmina model, and I don't even think you know what that means." Becca then took time to talk to Colton and she told him that she wants her next relationship to last. She said, "Have you moved on from that?" in reference to Tia. Colton didn't hesitate at all and said, "Yes." Colton said he just wanted to make sure that they started their relationship open and honest. They ended their conversation by making out. Seems like things may be back on track. If that wasn't enough, she got up and got the date rose and offered it to Colton! Wow, he's out of the dog house and then some! Another date card arrived and it read, "Chris, let's make your heart sing." She picked him up in a limo and they went to a recording studio! It's Capitol records! Richard Marx was there playing the piano. Becca acted like they were lifelong friends and called him "Richard." He's the one who sang, "Right Here Waiting." He even performed it for them! He told Chris and Becca to write love songs for each other and Chris was super nervous about it. Somehow it turned into him crying about how his dad didn't want to be his friend and shut him down. Chris revealed to Becca that getting vulnerable this early in the relationship was a lot of pressure. He asked for a kiss...was this all a ploy to get a kiss? Becca impressed Richard Marx and Chris with her lyrics. Chris also did an amazing job and it was very heartfelt! Richard Marx gave him the slow clap and told him he could drop the mic. Richard Marx then performed music with their lyrics! It was amazing, he just started strumming his guitar and made up a beautiful song. During dinner, Becca did her best to make Chris more comfortable talking about his history. Chris said he wasn't nervous about the one-on-one, he was just very nervous about opening up. He was worried he would talk about his past and Becca would just dump him. Chris revealed his dad left his family on New Year's Day when he was 7. He said as an adult, he reached out to his dad and he never responded. Becca said she was glad that he told her about that. Becca talked about getting dumped by Arie and her father's death. She said she understands it's hard to have a parent missing in his life. She decided to offer him the date rose. She was pleased that he could get out of his comfort zone and show her who he is. He accepted the rose and she grabbed him by his lapels and kissed him! Richard Marx was back to peform as the lovebirds danced and kissed. Back at the house, David had a medical emergency. There was blood everywhere! The guys were actually worried that he could die. The guys woke up to David lying on the ground straight as a board. Jordan screamed his name...so what happened exactly? Don't worry Chris Harrison is around to fill Becca in. Chris told her that David is in intensive care with a busted nose and face. He apparently fell out of his bunk bed and landed on his face, but he's expected to be fine. Chris called David on the phone and he spoke to Becca and sounded great. He told her that he would be back and he isn't leaving the show. Jordan then put bedrails on the bunks so he wouldn't fall off the bed too. The final date card arrived and it was for Clay, Leo, Christon, Ryan, John, Garrett, Mike, Lincoln, Connor, and Blake, and said "We can tackle anything together." 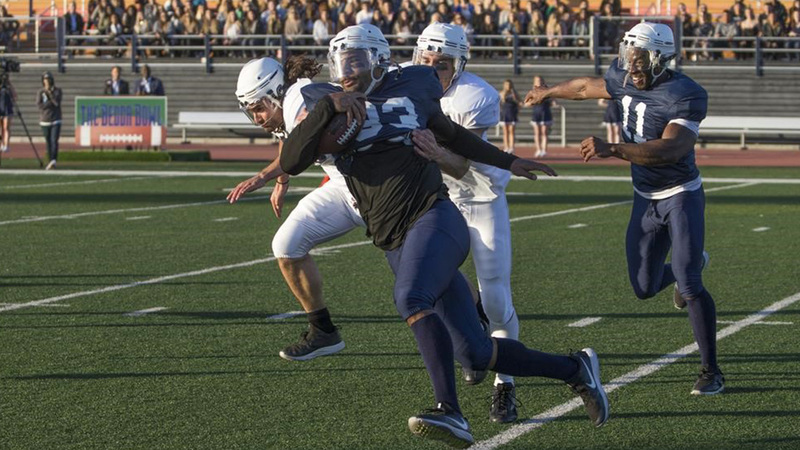 Some women football players helped train the guys and get them ready to play a game against each other. Clay was super excited to show off to Becca because he's a pro football player. Garrett had some fun helping Becca through the drills. Keyshawn Johnson (former NY Jet) was on hand to help Chris Harrison with the play-by-play for the game. Becca found it really hot watching the guys play in the game, she was having a great time. Garrett proved to be a great quarterback, while Clay did the best he could with some of the misfits on his team. Lincoln for one, being from England, was not very good at playing football. As Clay ran a touchdown into the end zone, he hurt his wrist. He got taken away in an ambulance to the hospital. Later that evening, Becca said she hoped Clay would be OK, but she was also excited to get to know the rest of the guys. Becca told Garrett that he always has fun even though he's only been on group dates. They practiced some tackling moves and Becca went in for the kiss! Garrett said, "That's the way a date should go!" Blake started to freak out a bit seeing Becca with the other guys. He's losing his confidence and feeling jealous. Becca gave him some kisses and he was back to normal. She also felt giddy when he told her that she feels like his girlfriend. Clay returned with his arm in a sling and Becca pulled him aside to chat. She kissed him and told him that she's so happy he was back. She even gave him the date rose! He called it his best date ever, despite breaking his wrist. Then it was time for the cocktail party before the rose ceremony. David was still not there. Colton set up some t-ball for Becca and him to play because he says he was more into baseball than football. 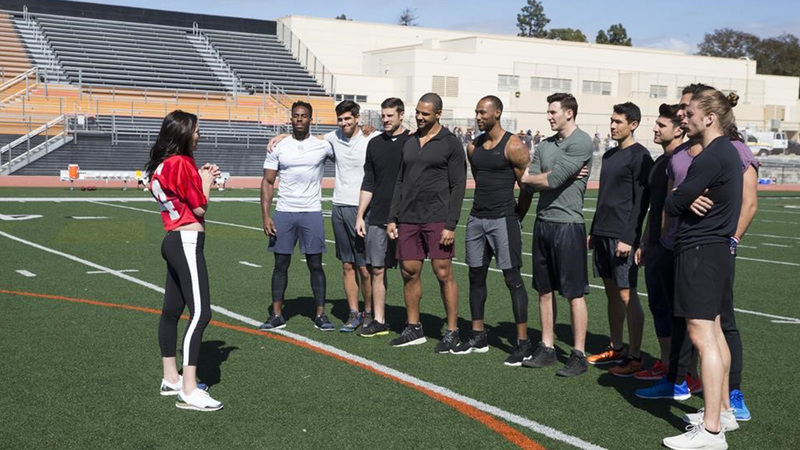 Clay revealed to the other guys that he has to leave the show early because he needs surgery for his wrist, but he's struggling because he wants to stay and compete for Becca. He wants to talk to her about it. He tells her that it's more serious than he hoped and he needs his job. He said goodbye to her and she didn't beg him to stay or say she'd wait for him, so I think it's pretty clear that she wasn't completely sold on him. The show ended before the rose ceremony, so we'll have to see how that goes next week. David will return, but the show blurred his face! So we'll have to wait to see that too!